Creamy Vegetarian Slow Cooker Soup with Wild Rice and Mushrooms is the perfect vegetarian soup for a cold winter day. It’s creamy, filling, and packs in over 12 grams of protein per serving. Is there anything better than a bowl of creamy and warm soup on a cold winter day? How about a bowl of creamy and warm soup that’s loaded with nutritious vegetables, is incredibly easy to make, and will make your house smell amazing thanks to cooking the soup in a slow cooker? 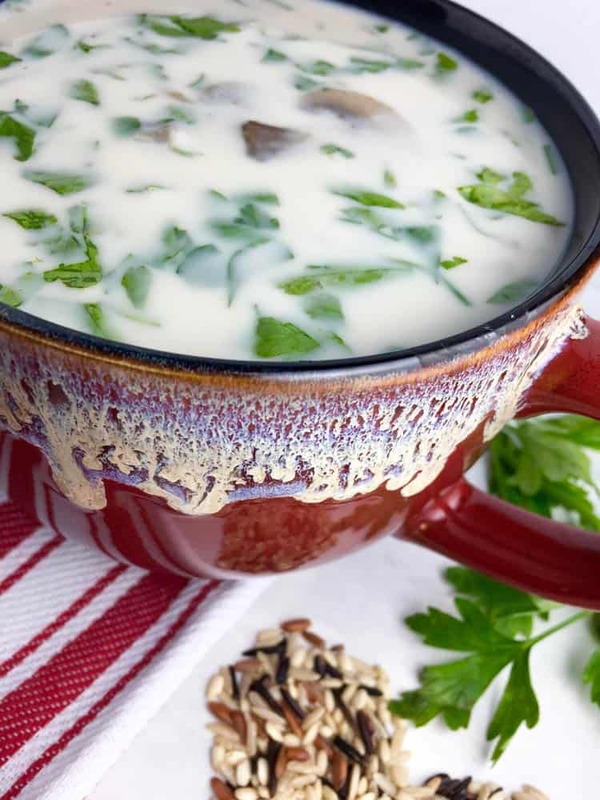 This Creamy Vegetarian Slow Cooker Soup with Wild Rice and Mushrooms certainly checks all the “great soup” boxes. 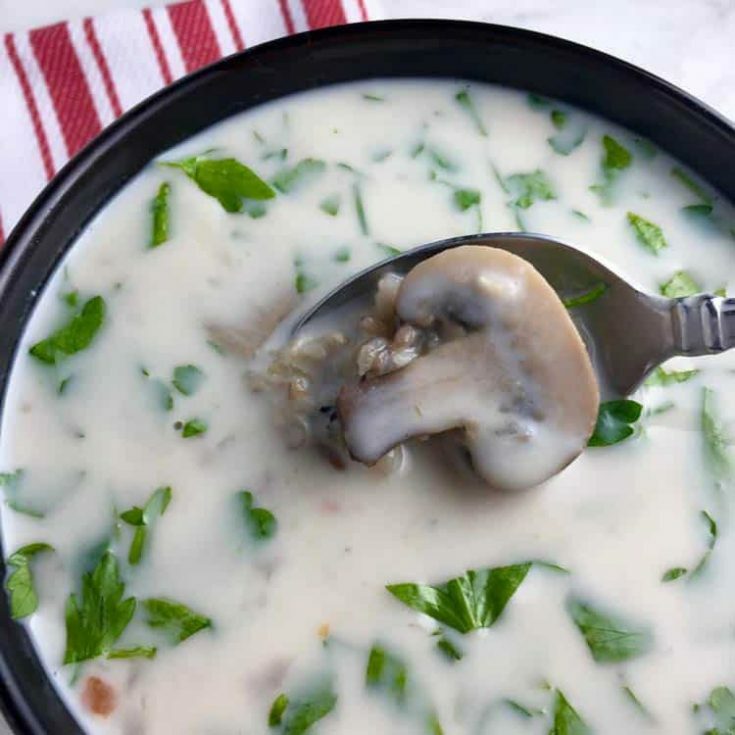 Creamy Vegetarian Slow Cooker Soup with Wild Rice and Mushrooms is so earthy and satisfying. Filling wild rice and chopped vegetables (mushrooms, celery, carrots, onion, garlic, and parsley) come together in a creamy base made from half-and-half and pureed cannelloni beans. Using pureed beans to add extra creaminess to soup is one of my favorite “soup tricks.” Doing so thickens the soup, adds protein (this soup has over 12 grams per serving), and lowers the fat content by avoiding the use of a large amount of high-fat dairy products. Tip #2: To reduce the sodium content of the soup, rinse and drain the beans before pureeing them with a little water. Tip #3: Don’t stir cold dairy products directly into the soup; they will curdle. Temper the half-and-half by adding a couple spoonfuls of the hot soup into the half-and-half before adding it to the slow cooker. Tip #4: Feel free to experiment with the vegetables in this soup. I made a batch without mushrooms for a friend who isn’t a mushroom fan, and it still tasted great. To make this into a vegan soup slow cooker soup, you can replace the half-and-half with full-fat coconut milk, although this will alter the flavor a bit. I’ve also heard there is a vegan half-and-half product at some grocery stores now, so take a look at your local grocery or health food store to see if it’s available to you. Want a Few More Vegetarian Slow Cooker Soup Recipes? Avocado Soup with Feta: This is a deliciously flavor-filled soup! Crockpot Monday: Loaded Potato Soup: This is an incredibly filling, easy-to-make, and hearty potato soup. 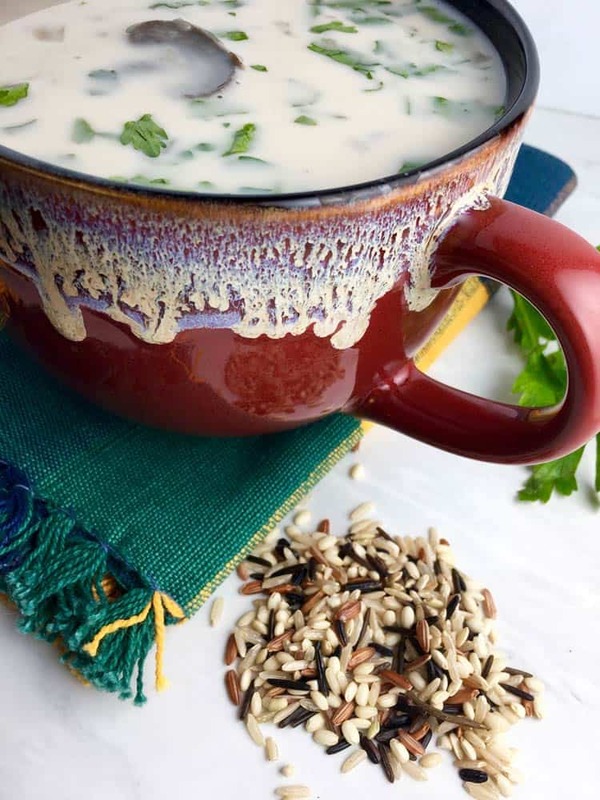 Neither of these recipes substitute some of the dairy products with cannelloni beans, so feel free to experiment if you like the inclusion of cannelloni beans in this wild rice and mushroom soup. I hope you enjoy Creamy Vegetarian Slow Cooker Soup with Wild Rice and Mushrooms! It’s the perfect soup to curl up with on a cold afternoon or evening. Creamy Vegetarian Slow Cooker Soup with Wild Rice and Mushrooms is a comforting and creamy soup, perfect for cold fall and winter nights. Rinse wild rice under cold water until the water runs clear. Drain and transfer to a 5- or 6-quart slow cooker crock. To a food processor, add onion, celery, carrots and garlic. Pulse everything to a very fine mince and add to slow cooker crock. Add 8 oz. mushrooms to the food processor and pulse until they’re finely chopped. Thinly slice the additional 4 oz. mushrooms. Add all mushrooms to the slow cooker. Puree beans until smooth and pour into slow cooker with other ingredients. Add bay leaf, garlic powder, and 6 cups of the vegetable stock. Season with salt and pepper to taste. Stir to combine all ingredients. Cover and cook on low for 6-8 hours or high for 3-4 hours. Begin checking for doneness after 5 ½ hours on low or 2 ½ hours on high (cooking time will vary by slow cooker). Adjust cook time accordingly. The rice will be tender but not mushy when done. When the soup is fully cooked, remove and discard bay leaf. Add tempered half-and-half, parsley, and remaining vegetable stock (if necessary) to achieve your ideal consistency. Stir to combine all ingredients. Add additional salt and pepper to taste. Serve immediately. 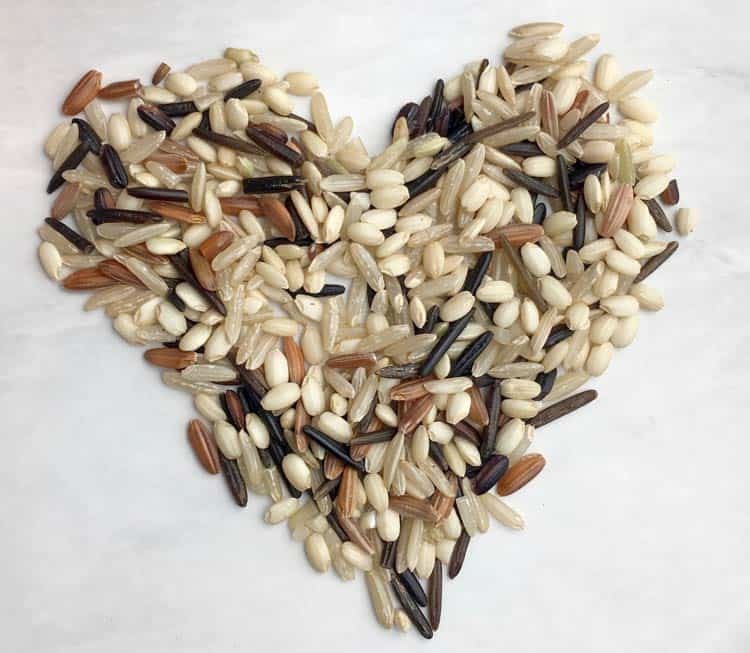 Use a multi-color wild rice blend. Rinse and drain the beans to reduce the recipe's sodium content. Temper the half-and-half before adding it to the slow cooker.